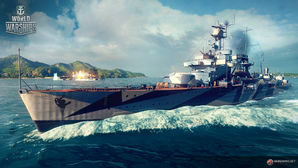 Admiral Makarov — Soviet promo premium Tier VI cruiser. 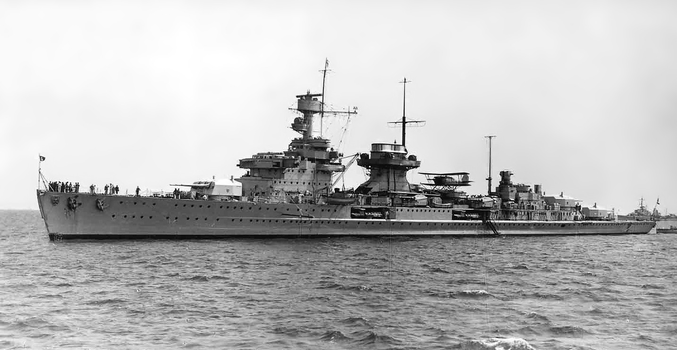 In 1945, the German cruiser Nürnberg was ceded to the Soviet Union as war reparations. Subsequently, she was renamed and partially rearmed. During an upgrade that followed, the ship's automatic AA guns and other equipment were changed, but her rapid-fire main guns, which were quite powerful for a ship of her size, were retained. Admiral Makarov was first released for sale on the NA, EU, and Asia servers on 20 December 2017. Veterans of Tier V and VI German cruisers Königsberg and Nürnberg will find Admiral Makarov to be familiar. This is hardly surprising since Admiral Makarov is basically a Hull (C) Nürnberg with a few minor differences. Admiral Makarov has a bit more stealth (lower detection radius) and a little bit less main battery range. Her mid- and short-range anti-aircraft armament has been completely redone, and she now packs a lot more punch in her middle ring while losing virtually all of her short-range AA guns. She has less overall AA than Nürnberg, but she has more available in her outer two AA rings than to hopefully thin out enemy bombers before they get too close. Like Nürnberg’s top hull, she does not have access to the Catapult Fighter ( ) consumable, but can choose between Defensive AA Fire ( ) and Hydroacoustic Search ( ). As this iteration of Nürnberg is Russian, she does not have access to the improved German version of Hydroacoustic Search. Like Nürnberg, Admiral Makarov has a few completely unique features. For instance, her two rear turrets fully traverse a 360° arc. This enables a captain to be completely angled towards an enemy ship, and change course while not having to worry about the rear turrets pointing the wrong direction. In addition, the high explosive shells on Admiral Makarov do not follow the normal HE penetration rules, where shells are capable of penetrating armor 1/6th their caliber. Instead, Admiral Makarov follows the German cruiser HE penetration rule — which is 1/4th instead — and her HE shells will penetrate any armor less than 37mm thick. This basically equates to having the Inertial Fuse for HE Shells skill baked into the ship herself. Admiral Makarov’s strengths are noteworthy, but so are her weaknesses. While Nürnberg veterans may be used to it, her turret layout is still somewhat awkward and she is very lightly armored. Battleships can citadel her with ease at virtually all angles, and enemy heavy cruisers — such as Aoba or Molotov — salivate at the thought of catching Admiral Makarov broadside with AP rounds in their barrels. 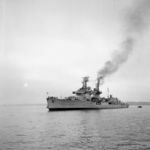 At very close range, players may actually want to sail broadside to battleships in an attempt to maximize over-penetrations due to the hull's narrow beam, but this will not work as well against cruisers. Playing Makarov well requires careful positioning and extremely good situational awareness; she is not a ship that one can put into a risky situation and live to fight another day. She'll reward cautious play, but will fold quickly under concentrated enemy fire. Good gun handling and shell speed makes her an ideal anti-destroyer ship. Guns reload every 6 seconds, far faster than most of her peers at Tier VI. Surprising AP damage when it punches through. The 'X' and 'Y' turrets can rotate 360 degrees, making switching firing sides a snap. Virtually a direct clone of Hull (C) Nürnberg, including the single torpedo launcher on each side. AA suite will still struggle to shoot down many airplanes unless Defensive AA Fire ( ) is active. Loses access to German Hydroacoustic Search ( ) consumable. Very little armor, making modules vulnerable to incapacitations and devastating citadel hits. As a Premium ship, Admiral Makarov doesn't have any upgrades to research. This upgrade configuration increases the durability and power of Admiral Makarov’s anti-aircraft armament. For players who do not wish to specialize in anti-aircraft duties, Main Armaments Modification 1 ( ) should be mounted in Slot 1 and Aiming Systems Modification 1 ( ) should be mounted in Slot 2. Key skills for Admiral Makarov commanders include Priority Target, Adrenaline Rush, Demolition Expert, and Concealment Expert. As a Premium ship, Admiral Makarov comes included with Type 10 camouflage that lowers her detection radius, reduces the accuracy of incoming shells, reduces her repair costs, and increases the amount of experience she earns. Recommended combat flags include Victor Lima ( ), India X-Ray ( ), Sierra Mike ( ), and November Foxtrot ( ). Captains who have equipped Defensive AA Fire ( ) should also equip November Echo Setteseven ( ) to maximize their AA. Admiral Makarov, like Nürnberg, has the ability to turn its rear turrets 360 degrees. An enemy Shiratsuyu strays too close to the Admiral Makarov. Flag of Admiral Makarov. Given to players who purchased a special bundle containing Admiral Makarov. Nürnberg in Kiel in 1946, after being ceded to the Soviet Union. This page was last modified on 19 February 2019, at 10:19.